Demotic refers to both the ancient Egyptian script derived from northern forms of hieratic used in the Delta, as well as the stage of the Egyptian language following Late Egyptian and preceding Coptic. By convention, the word “Demotic” is capitalized in order to distinguish it from demotic Greek. The Demotic script (formerly referred to as Enchorial Egyptian) was used for more than a thousand years, and during that time a number of developmental stages occurred. Early Demotic (often referred to by the German term Frühdemotisch) developed in Lower Egypt during the latter part of the 25th Dynasty, particularly on stelae from the Serapeum at Saqqara. It is generally dated between 650 and 400 BC as most texts written in Early Demotic are dated to the 26th Dynasty and the following Persian period (the 27th Dynasty). After the reunification of Egypt under Psametik I, Demotic replaced Abnormal Hieratic in Upper Egypt, particularly during the reign of Amasis when it became the official administrative and legal script. During this period, Demotic was used only for administrative, legal, and commercial texts, while hieroglyphs and hieratic were reserved for other texts. Middle Demotic (circa 400¬30 BC) is the stage of writing used during the Ptolemaic Period. From the fourth century BC onwards, Demotic held a higher status, as may be seen from its increasing use for literary and religious texts. By the end of the third century BC, Greek was more important as it was the administrative Egyptian language of the country; Demotic contracts lost most of their legal force unless there was a note in Greek of being registered with the authorities. From the beginning of the Roman rule of Egypt, Demotic was progressively less used in public life. There are, however, a number of literary texts written in Late Demotic (circa 30 BC¬452 AD), especially from the first and second centuries AD, though the quantity of all Demotic texts decreased rapidly towards the end of the second century. After that, Demotic was only used for a few ostraca, subscriptions to Greek texts, mummy labels, and graffiti. The last dated example of the Demotic script is dated to 11 December 452 AD and consists of a graffiti on the walls of the temple of Isis on Philae. Coptic is the last phase of ancient Egyptian. 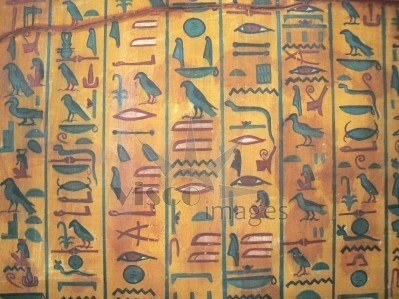 It is the direct descendant of the ancient language written in Egyptian hieroglyphics, hieratic, and demotic scripts. The Coptic alphabet is a slightly modified form of the Greek alphabet, with some letters (which vary from dialect to dialect) deriving from demotic. As a living language of daily conversation, Coptic flourished from ca. 200 to 1100. The last record of its being spoken was during the 17th century. Coptic survives today as the liturgical language of the Coptic Orthodox Church. Egyptian Arabic is the spoken and national language of Egypt today. Old Egyptian was spoken for some 500 years from 2600 BC onwards. Middle Egyptian was spoken from about 2000 BC for a further 700 years when Late Egyptian made its appearance; Middle Egyptian did, however, survive until the first few centuries AD as a written language, similar to the use of Latin during the Middle Ages and that of Classical Arabic today. Demotic Egyptian first appears about 650 BC and survived as a spoken language until fifth century AD. Coptic Egyptian appeared in the fourth century AD and survived as a living language until the sixteenth century AD when European scholars traveled to Egypt to learn it from native speakers during the Renaissance. It probably survived in the Egyptian countryside as a spoken language for several centuries after that. The Bohairic dialect of Coptic is still used by the Egyptian Christian Churches.Old, Middle, and Late Egyptian were all written using hieroglyphs and hieratic. Demotic was written using a script derived from hieratic; its appearance is vaguely similar to modern Arabic script and is also written from right to left (although the two are not related). Coptic is written using the Coptic alphabet, a modified form of the Greek alphabet with a number of symbols borrowed from Demotic for sounds that did not occur in Ancient Greek. Most “surviving” texts in the Egyptian language are primarily written on stone in the hieroglyphic script. However, in antiquity, the majority of texts were written on perishable papyrus in hieratic and (later) demotic, which are now lost. There was also a form of cursive hieroglyphic script used for religious documents on papyrus, such as the Book of the Dead in the Ramesside Period; this script was simpler to write than the hieroglyphs in stone inscriptions, but was not as cursive as hieratic, lacking the wide use of ligatures. Additionally, there was a variety of stone-cut hieratic known as lapidary hieratic. In the language’s final stage of development, the Coptic alphabet replaced the older writing system. The native name for Egyptian hieroglyphic writing is s?? n mdw n?r or “writing of the words of God.” Hieroglyphs are employed in two ways in Egyptian texts: as ideograms that represent the idea depicted by the pictures; and more commonly as phonograms denoting their phonetic value.